Rodney Jackson and Darla Hillard of Snow Leopard Conservancy just returned from spending two weeks in the Kyrgyz Republic and France with Indigenous Cultural Practitioners from around the world to work towards linking western science and indigenous practices for snow leopard conservation. The account below is from Nargiza Ryskulova, one of the translators and videographers at the gathering. Suddenly she came out from the bushes: a spotted large cat, so beautiful I have never seen before. I stood there speechless, afraid to move, afraid that she will hear me from beneath the gates. She turned her head suddenly and looked into me with mesmerizing blue eyes, then she walked slowly from one point to another and hid in the shade. I could hear my heart beating loudly. This was the first time I saw a live snow leopard. How many of Kyrgyzstani have seen a live snow leopard? How many of us know anything about snow leopard? Do you know that Kyrgyzstan is one of the 12 countries, where snow leopard is still preserved? Neither did I until this year when I was invited to participate in preliminary meeting of traditional practitioners from various country to draft a suggestion from indigenous people to UN policy makers on how to preserve a snow leopard. At the meeting I have met people from America, Mongolia, Altai, Kyrgyzstan, Buratia all gathered together and speaking about forgotten knowledge of their people, the knowledge of snow leopard. As I was listening to these indigenous elders I wondered how far my generation is from nature. The answer was very far. A snow leopard was one of the most valued animals in every country it lived ; for several reasons, one being that it was believed to be an animal that speaks of the purity of its ecosystem. It was also known as one of the purest and courteous predators, which would never attack a human being or a sick animal, or a domestic animal. It’s eating, mating and living habits spoke of its wisdom, efficiency, and often sacredness for the indigidenous people, who shared the habitat with snow leopard. They believed that spirit of snow leopard , lives on the top of the highest mountain and unties people with nature, they believed that snow leopard’s presence ensures the connection. Now both the behavior of humans and snow leopards has changed. People hunt snowleopards for their fur that costs 3000 usd on the black market, people hunt its prey mountain goats, archars and any other animal they can hunt. Snow leopard fights against extinction, kills domestic animals, for which get killed by locals, still move closer to extinction. 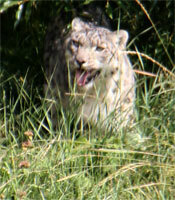 The snow leopard I saw was limping; it is kept in reservoir of animals taken away from poachers. It will never be able to live in wilderness again, this beautiful animal was ruined by humans, just like most of the nature around us. I wondered how far my generation will go in reconnecting with nature and how much we will have to suffer from paybacks for deeds of humans to the nature.